Avantech’s single-source product development offering connects concept to reality to bring new products to a global marketplace. The rotational molding process yields a number of unbeatable manufacturing results, delivering products that are recyclable, resistant to chemical attack, and virtually indestructible. As a result, rotational molding is the fastest growing plastics manufacturing process worldwide, and rapidly gaining traction in end-use consumer markets such as recreational marine, furniture, outdoor leisure, and sports equipment, to name a few. With more than 30 years of experience in servicing the rotomolding industry, Avantech understands all aspects of the plastics manufacturing process. 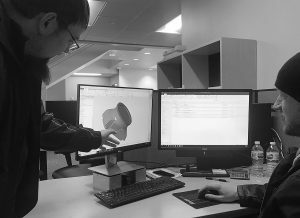 We’ve amassed the know-how to translate this understanding in designing and developing products that optimize the aesthetics, functionality, and cost-effectiveness of the rotomolding process. Now more than ever, both new and long-term customers lean on us for product development that optimizes the unique attributes of rotational molding in plastics manufacturing, while accelerating speed-to-market and driving-down manufacturing costs. Our team can engage at the conceptual stage and develop product design from start-to-finish, analyze established designs to confirm manufacturability and cost-effectiveness, or suitable combinations to drive successful new product launches. Deploying our “think, create, advance” mindset and combining our multi-disciplined manufacturing capabilities, Avantech’s single-source product development offering connects concept to reality to bring new products to a global marketplace. Want to learn more about Avantech manufacturing capabilities?